The Red Wolfe cruiser is a period-specific themed bike designed in conjunction with Mike Wolfe of the TV show “American Pickers.” The show centers on Creator and Executive Producer Mike Wolfe’s antique store Antique Archaeology. The Red Wolfe is customized with an oversized springer seat with embossed Antique Archaeology logo, which also appears on the top tube. 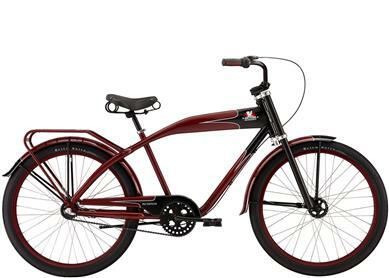 The Red Wolfe is a limited edition cruiser with each one coming with an individualized plate bearing Mike’s signature and a unique production number.